WeSNiP Celebrates 17,000th Spay/Neuter Surgery at Meows & Mimosas! on May 20 in Bellingham. 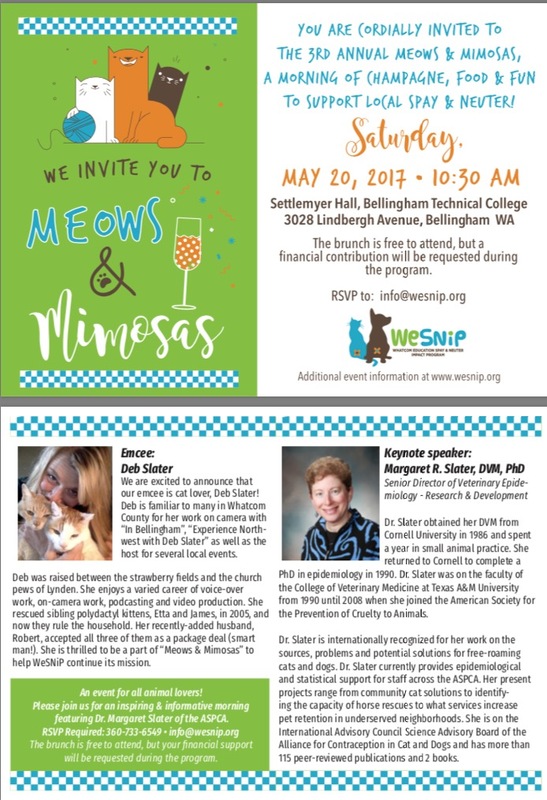 Meows & Mimosas begins at 10:30 a.m. in Settlemyer Hall at Bellingham Technical College, 3028 Lindbergh Avenue. Our keynote speaker is Dr. Margaret Slater, Senior Director of Veterinary Epidemiology – Research and Development for the American Society for the Prevention of Cruelty to Animals. or send an email to info@wesnip.org. All event proceeds from Meows & Mimosas will support spay/neuter surgeries for cats in our community – including feral/free-roaming cats. Since 2010, WeSNiP has trapped, neutered and returned 2,307 untouchable cats, which has significantly reduced the number of community cats. Animal shelter statistics show the intake and euthanasia of feral cats has decreased by 83 percent since WeSNiP started in 2008. The 17,000th surgery occurred recently after an elderly couple in rural Bellingham asked WeSNiP for assistance, according to WeSNiP Executive Director Audrey Seaholm. The original estimate was 12-15 cats, but on trapping day WeSNiP discovered the numbers were significantly higher – closer to 40. It is because of community support that WeSNiP was able to help. WeSNiP is a by-donation service that makes it possible to offer compassionate and humane solutions, like Trap-Neuter-Return. Please plan to be a part of the celebration and reserve your place at Meows & Mimosas. Whatcom Education, Spay & Neuter Impact Program.